UPDATE: The video itself seems to have been taken down, but you can still listen to it here. If you dare. 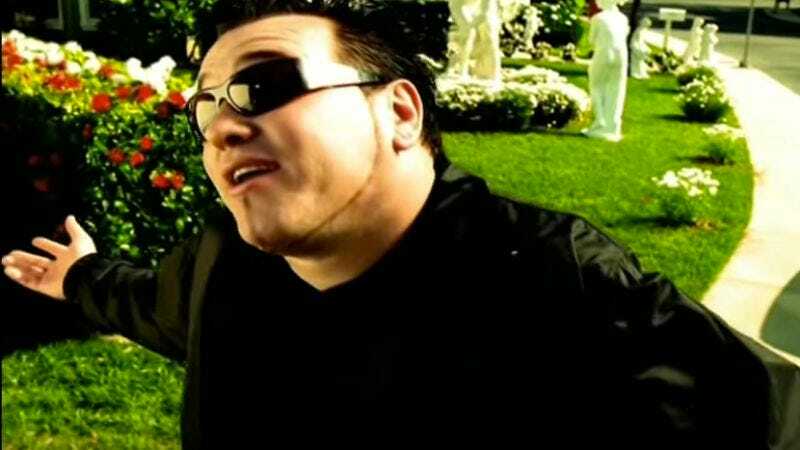 The life cycle of Smash Mouth’s “All Star” is a fascinating one. The second single from the band’s 1999 album Astro Lounge, the song was a huge hit for the one-time ska band. True to its era, the song’s video featured a tie-in to the Ben Stiller box office flop Mystery Men, including an appearance from a young Dane Cook, as the band strutted through a delightfully suburban landscape. Since then, the song has taken on a second life as both a muse and a musical punchline. It’s been mashed-up time and again, and also served as the soundtrack to Smash Mouth singer Steve Harwell’s expletive-laden rant at the Taste Of Fort Collins festival that’s affectionately known as the “bread incident,” as well as that time he ate a bunch of eggs with Guy Fieri. The latest take on “All Star” is this disorienting version that first surfaced on Tumblr and sees the song’s studio version hacked and chopped so that everyone in Smash Mouth is playing the song at slightly different tempos. It’s a bit of a mindfuck to listen to, but is just another chapter in the ever-growing history of the song’s newfound meme status.